Here in Puerto Rico, we are studying several species of lizards that scientists don’t know much about yet. One of those species is called the Ponce Grass Anole (Ponce is a town in southern Puerto Rico), and its scientific name is Anolis poncensis. (This species is a relative of Anolis carolinensis, the green anole we often write about on this blog.) We’re spending a lot of time right now watching the behaviors of the grass anole, to try to learn more about how it acts in its natural habitat. One of the surprising things we’ve learned in watching the Ponce Grass Anole is that the males seem to catch very large insects to eat. So large, that they can’t eat the whole insect at one time! The other day, I watched a lizard stalk a stick insect in the grass. He caught the stick insect, and then carried it to a branch on the ground where he could sit and chomp away on it. (You can see the lizard eating the insect in the picture above.) He only ate about 1/4 of the bug, and then dropped it by the ground and ran over to a tree. The lizard flirted with a female lizard for a while, ran around on the tree trunk, and then in a bush beside the tree, and then, after a while, came back to the branch. He picked up the stick insect again and kept eating it! And a student in our research group, Jake, saw the same thing happen with a grass anole eating a beetle! This is really cool, because it takes a lot of thinking ability to leave something somewhere, and then come back and find it. (Have you ever lost your shoe, or your homework? It can be hard to remember where you left it, right?) Most people, even scientists, don’t think lizards really have strong thinking ability, so it was exciting to watch these lizards do something so smart. We learn new things every time we watch lizards in the field! 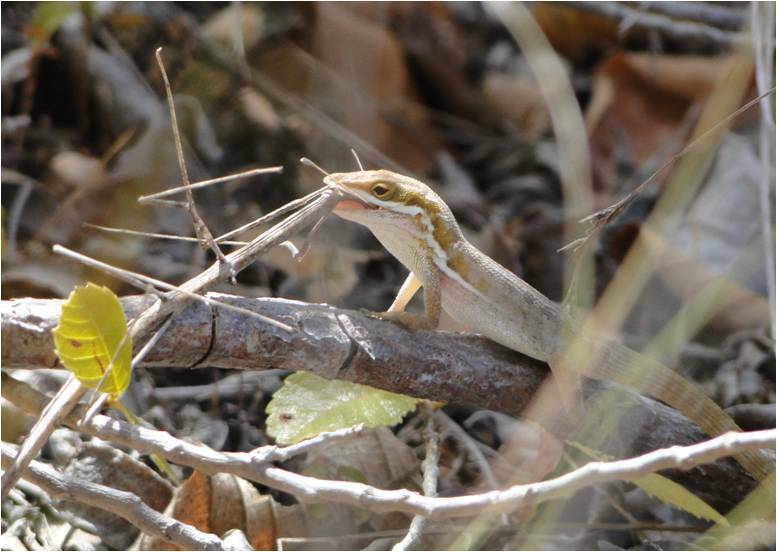 lol, before i read the writeup, i was wondering why the anole was eating a stick!! !